Information accountability is seen as a mode of usage control on the Web. Due to its many dimensions, information accountability has been expressed in various ways by computer scientists to address security and privacy in recent times. Information accountability is focused on how users participate in a system and the underlying policies that govern the participation. Healthcare is a domain in which the principles of information accountability can be utilised well. Modern health information systems are Internet based and the discipline is called eHealth. In this paper, the authors identify and discuss the goals of accountability systems and present the principles of information accountability. 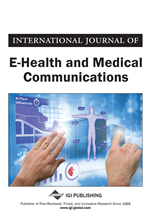 They characterise those principles in eHealth and discuss them contextually. They identify the current impediments to eHealth in terms of information privacy issues of eHealth consumers together with information usage requirements of healthcare providers and show how information accountability can be used in a healthcare context to address these needs. The challenges of implementing information accountability in eHealth are also discussed in terms of our efforts thus far. Information privacy concerns are usually coupled with information security, which mainly involves unauthorised access to information by external entities. But, addressing data breaches by authorised users pose the biggest challenge and it is a significant aspect for eHealth systems. Some even claim that privacy threats are internal factors and not external (Kierkegaard, 2011). Therefore, patients have an expectation of confidentiality in their dealings with any qualified clinician or healthcare professional (Croll, 2011).